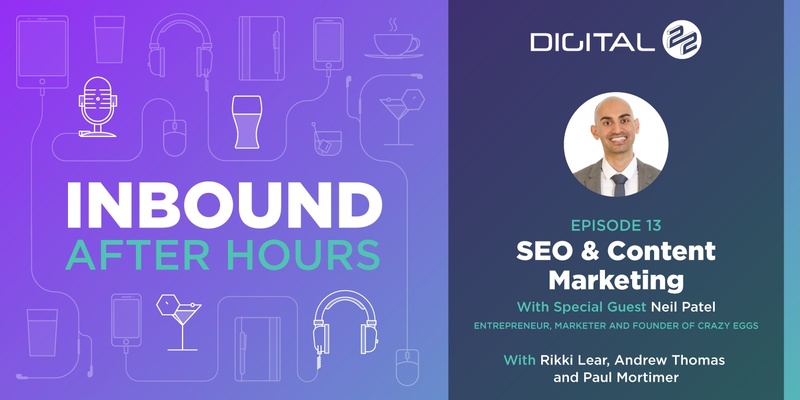 Wow - this week we have another huge guest from the digital marketing world - best selling author and Co-Founder of Crazy Egg & Hello Bar: Neil Patel! In this episode with speak to Neil about SEO, content marketing and other digital marketing tactics working today. Neil's number 1 marketing tip! As always, thanks again for joining us on this week's podcast. With all of this newly acquired SEO and content marketing knowledge, why don't you start putting together your first inbound campaign with these tried-and-tested inbound marketing templates?! - Hello and welcome to Inbound After Hours. We've got no Mark today, he's away at a wedding but we've got myself, Paul, Rikki and Andrew. And, we've got a very special guest this week. He's a founder of several companies you've heard of; KISSmetrics, Crazy Egg. He's New York Times best selling author and it's Neil Patel. Thanks for coming and joining us Neil. - Just in case the off case, any of the listeners and viewers haven't heard of you, can you just tell us a bit about your background, your story, where you've come from, selling CD's at school to where you are now. - Yeah, so, I'm an entrepreneur, marketer. I started off looking for a job on the web. I couldn't find one, so I created my own job board. I realised after I created the job board and I popped it up, that just because you create something and then launch, it doesn't mean you get visitors and traffic. I learned that a bit too late. So, then I had to learn marketing. Because I thought people would just naturally come to your website, right? Which we all know is not the real case. And, then from there, I focused on trying to grow the traffic. I learned it, I got good at it. I created an agency. Hated agency work. And, then eventually I got into creating software companies that help people with their marketing. - I was reading a bit about, was it 15 you were when you first did your first website? - 15 and a half, somewhere around there. - Fantastic. So a little bit earlier than most trying to get on with that. - I think I had the GeoCities website. - Yeah, GeoCities was all about it back in the day. - Just full of gimmicks, like Homer Simpson's website. Trails and everything, you could barely do anything. - So, what is your main focus today? What do you do day to day now? - My main focus today is just growing the traffic, right? Whatever I can do to grow my own traffic. And, then my sales guys, the marketing guys, the developers, the rest of the team, they make sure the funnel converts. You know, we're generating revenue from it. My only real job these days is to drive traffic to my businesses. I don't have to do anything else. - What tactics are working for you today? What's working well that driving traffic to the site today? - What's working well right now is just SEO and content marketing. It's been working for years, but shockingly, no one still does it. Everyone talks about "Content marketing, it's amazing". Go write blog posts. And, people are like, oh no, it's a lot, what's my ROI going to be, how long is it going to take? And, I'm like, that's the sad part about the space, you don't know the real answer. I can't tell you. Most people don't know, but you know what, it's worth it and it consistently has produced, for not just me, but look at companies like HubSpot. They're so large now and it's purely through content marketing. - No, exactly. What's in the last few years, on the flip side, what are the sort of things you're putting out and not focusing on anymore? Are there any tactics in the last five years or so that have stopped working, that you have stopped investing time or money in? - No, I've been investing in pretty much everything, I don't, it's more so, I don't start investing in things. So, when everyone's on SnapChat, I don't get on SnapChat just because everyone else is on. Everyone else is on Instagram, doesn't mean I'm going to use Instagram heavily. I'm a big believer in go after channels that arleady drive volume, traffic, are proven. And then the ones that start becoming proven, then jump on them after others are getting results. Because as a business, you can usually spend money to make up not being the first player in the space, right? - I mean, when we look, read through your blogs, in tends to be very long form content. Seems to be the way you go with it. Is that a deliberate attempt after looking at the stats and the way search works these days? What's forced you down the route? - You got it right. So, it really comes down to long form content, 2000 plus words, making sure it's super thorough. It's really educational and from there, it's just doing the same old stuff, but doing it in quantity. You see the thing with marketing, especially on the web when it comes to SEO and stuff like that, most people aren't willing to do whatever it takes to crank out a tonne of quantity. And without the quantity, you won't do well. - Exactly, one of the things we've found, we were analysing our own blog for a talk we did a month or so ago and we noticed our top five, top ten blogs were well over 2000 words. They were our best traffic drivers. We were actually getting long form content to convert. So, when you write an 800, 1000 word blog, you get to the bottom of the blog, you tend to have a CTA at the bottom. When you're dealing with really long form content, you've got to chop it up and put those calls to action in and throughout. What's been your best tactics in terms of converting really long form blogs? What works for you guys? - So, I tend to collect an email first and then from an email I will get someone to become a customer. Because if I focus too heavily on the, let's say the customer angle and converting them, I find it doesn't work as well as building a rapport and then through email, it's just closing them, right? That's worked really well for us. - Yeah, so do you use an automation platform to as soon as someone signed up to your newsletter, nurture them over time? - That's correct, yeah. We use ConvertKit. But you can use InfusionSoft, HubSpot. It's up to you, the possibilities are endless. - Me and Paul were having a chat when were looking at the Twitter channel, weren't we? And noticed that when you were talking about quantity, I think you had a look into that? - Yeah, I know Andrew said it as well, we were looking at just your Twitter feed. So, what, do you post every half hour it seems like during office hours? - Yeah, I'm really active, or my team is active sometimes for me. When it comes to scheduling, I have people helping me out. When it comes to replying to people and stuff, I do that myself. But, yeah, it drives a tonne of traffic. - We upped our Twitter output from doing a couple on the day we publish a post and one after, and we upped to to three, and I was worried that was going to be a bit much. But, I take it you've tested it and found that just volume on Twitter, is that fast, because people follow that many people. The feed doesn't get cluttered with your stuff. You haven't had that, have you reached that ceiling yet? - Yeah, I think I have, I could be wrong. - It's just looking at what the saturation point is for that, and that's what we've been trying to find, as agency is how, where do we reach that. I think, if you've got the half an hour, that's good going, it's a bit ahead of where we tested to and it obviously must work for you, like you say, cranking out the quantity. - Yeah, and I believe in focus too, right? So, it's like, you can't do everything. What works best for you. For me, it's content marketing. I do YouTube stuff and I try other channels, but I probably dominate content more than anyone else, but that's also what I'm really good at, right? So, you've got to figure what you're exceptionally great at and focus just on that. Of course, you can expand. We do videos and we've been expanding, but it's still the same old playbook that worked three years ago that still works for us. - When do you think you'll go more in favour of video? - When I'll be more in favour of video? I'm already heavy into video. I think that change is coming soon, for everyone. In which, Facebook Live, Facebook videos do extremely well. And, same with YouTube, right? It's really popular and according to Alexa, at least at the moment, YouTube is more popular than Facebook. - I spotted on your site the about you page is just a video of you, your home page is pretty much dominated by a video of just you. How did you find, I'm sure you've been doing video longer than most of us, but how did you find getting into that early stages of using video on your home page or as a main content for something like the about you page? Was that an easy transition? - It's just testing. So, for me just testing out quite a bit, you end learning what works or what doesn't work and then you go from there, right? But, I didn't know video would work better. My previous page was a text based and then I tested it out and I found that the video ended up converting just as well if not a bit better. So, then I focused on that. - What about the idea, sorry, it cut off there, what about the ideas Andrew was getting at? So, you're talking about having no top nav and having a different user experience on your site. Where do you get the ideas from for things like that? - Sometimes my team members. Sometimes other people's websites. Like I have a gif in my exit pop up. I got that from my buddy, Brian Dean. He's just like, yeah, it works well. I tested it. And, I like OK.
- It's the best way to do it, isn't it. So, you talked a lot about SEO in terms of being your background as well as content marketing, what do you think the landscape for SEO is looking like at the moment? Do you think there's anything on the horizon that's going to change things for marketers, or do you think it is business as usual? - SEO is the same as it's been, it was a few years ago. Everyone's like, all these algorithms have made it hard. It's not really, if you focus on the user, you'll always do well. Sure, the thing that's changed is that instead of doing well in six months, it may take a year or two. But, it still works that same, it's just a long term play. - Yeah, I know, we'd agree with that. We've talked about it a lot, haven't we? I think it's easy to get distracted by shiny objects in SEO, or things that may influence search and things that are coming up and a lot of people seems to skip what we call the basics, just good on site optimization, good link earning. That seems to get overlooked a little bit. But, for us that's still how SEO works. Over the years, Google's still a link based algorithm at the end of the day, isn't it? - It is heavily link based. You get a lot of links, you'll do better. - What are you and your team thinking about things like voice search and are you preparing for that in any way, or is it something that is on your radar? - Not really, I don't do really any voice search or anything like that. I just focus on whatever is out there and I can't control how people use voice, but, more so I just get it out there and whatever happens I adapt with it, right? That's marketing. Stuff's always going to change, you're always going to adapt, have new platforms, new players. That's OK. Live, learn, you adapt. - Is your SEO strategy very heavily focused on the blog and the content side of it? Is that what you're mainly trying to drive, that sort of awareness stage, long tail keywords? Is that the biggest part of your SEO strategy? - It's not really keywords, it's not really content. It's what a user is going to end up reading. That really determines everything for me. - Yeah, what does your week look like at the moment? What are the things you're really focused on personally? - I just focus on work and all I focus on is new traffic acquisition tactics. I'm testing a lot with push notifications, which a lot of websites aren't using. I'm testing a tonne, right now, when it comes to Messenger chats and bots and stuff like that. But, yeah, I'm having a blast just testing new acquisition channels. - I saw a blog post on that actually that you sent out earlier that if you aren't using Messenger chat, you're missing out. Can you just talk the listeners through that? What's the ...? - Yeah, the open rates are like 80, 90% and the click rates are like 30, 40%. And, so if you're not on there, you should be communicating with your audience while it lasts. Because I don't those percentages are going to be there forever. - And what you've signed up is it direct to Facebook Messenger? Is that what you find works best at the moment from a chat? - Well I offer an eBook and they can claim it on Facebook Messenger. - Cool, good idea. How about, I know you mentioned, push notifications, this isn't something that we've talked about on the show before, but I assume you're talking about Chrome browser notifications, is that right? How does that work for you? What's the subscription rate like compared to something like email or Messenger? - It's better than email, the unsubscribe rate is higher than email. But, open rates are, I forget my open rates, my click rates are roughly like 18,19%. Which is higher than email, by far. - And, are you just RSS feeding the blog content out on that, is that how it's working? - That's all I do. I had to adjust the headline, because the push notifications in the browser, you're limited on character length, but it works so well. - We haven't tested that to be fair. We've testing a lot with Facebook Messenger and getting signups on that. And, like you, like 90% open rates, 20% click rates, etc., so it looked really interesting, but, I think the next one is to try is browser notifications. I think that's a really smart move. - It's worth it. It takes a while, but it really is worth it. - Yeah, we've found that with lower traffic sites than you're probably used to working with, what can people do to really push people onto either browser notifications or Messenger, because it seems quite low numbers to start with, when we've been testing Messenger out on ourselves and clients, actually takes quite a bit of time to get a meaningful audience. What have you found really pushes people into things like Messenger and gets them on that? - Yeah, it does take time. It doesn't work, you know, as great in low volume, but percentage-wise, it still works the same as it does in high volume. What I mean it doesn't work well you're not going to be like "Oh My God, I'm getting 5000 visits from push notifications", but percentage-wise, it will still make up a good portion of your traffic. Same with Messenger, all this stuff adds up. Don't worry about it if you're small and you don't have the volume yet. - It's quite clever what you're saying in terms of putting the content behind that and that's the way to get it, is by getting to Facebook Messenger. We've been more testing with kind of subscribe, or sign up, etc., which I guess doesn't make that sense, because that doesn't work as well with even email, just like sign up to our newsletter, doesn't work as well as an eBook does it? So, I guess that's what we need to try. - I think we've mentioned, we hope it's not, but we've heard email newsletters aren't as popular, they don't get opened as much. So, if people are in their browser, or into their social media inbox, it's the same basic content you're sending isn't it? Sending where they want it. - No, exactly. How are you finding email for your channels, is it still as strong as it was three, four, five years ago? - No, it still works well. - Yeah, no, we've noticed it as well. It looked it came to a period where it kind of plateaued a little bit. It looked like it was dropping for a few years. - People have issues with emails because they don't clean their lists. If you clean your lists, email's always been fine. - That's a really good point, certainly we've putting a lot of time and effort into for ourselves and clients is the idea of what we call, which is what HubSpot coined it, it's kind of like grey mail. That where you've got a lot of subscribers, but they're really not engaged at all and it's kind of falsely boosting your numbers. We've been spending a lot of time cleansing those guys out. - It's not a problem, though, is it? I know we've said it a couple of weeks ago, very happy to stay signed up to an email, but just don't open them. If it was into my Facebook inbox, I would open it. - Yeah, how long do you think things like Messenger's got left as being a really unique proposition so like those open rates are like 90%. - I will say it will last for years. The question is is how good will it be in a year or two? - Yeah, and how long will it last compared to something like email? So, the way we always try and wrap up is to get your, if you could give one tip for our listeners, who are normally sort of mid-market in-house managers, marketing managers, what would be the one tip to give them to go and look into or work on today? - If you're in-house, set goals for yourself. So break down your marketing tasks in very small bit-size chunks where you can say, alright, on Monday, you can create some goals. Like the goal could be increase conversions, increase traffic. By Wednesday, you can get it implemented. By Friday, you can see results. And, if you do that, you'll notice that you'll increase how fast you execute. And, if you able to deal within the time frame, and you're saying, oh people move too slow, or there's this problem with my company, or this is going to take forever, A: you're making excuses and B: your tasks are too big. So, break them up and make them even smaller. Like I wouldn't to something that's like, I want to grow my traffic by 10% by the end of this week. If my overall goal is to grow by 10%, one of the things can be like, OK, well to grow by traffic, I know I'm not going to get 10% in one week, but to grow traffic, I have to publish more content. I normally publish one blog post a month, let's see if I can publish another blog post just once this week and that would be my task, right? To blog, create it and then of course you want to promote it as well. - That's a really good tip actually. - And one that's no one's ever mentioned because when we go out to see clients and you talk about their goals, they're like annual goals, they're so big and long term that no one's breaking them down. - Yeah, no one is. And that is why most of them miss them. - Yeah, I think that's great. It's a quick way to execute and get things done. And, that's something we're huge fans of. - I'm using that one. - I like that tip, definitely. - It's solved, it's answered one question I had really. I wanted to ask you about, somebody involved in as lots of things as your are, we are busy in our ways, and people watching will be. Just time management in a marketing role can be challenging, especially when stuff's coming at you from all angles. How do you manage your time and stay organised? Do you put stuff, and say no, I'll deal with that when I have time next week? - I use an app called RescueTime. It helps you manage your time and improve your efficiency for free. - Fantastic. We need to take a look at that. - We need to put a link in for that. - Yeah, we'll put that in the notes, won't we? Fantastic. Well, I appreciate, you're a busy man so really appreciate your time today. - It's been a blast, thank you for coming on and, yeah, let's wrap that up. - Great, thanks again Neil and thanks for joining us. Thanks James on the cameras as usual. So, we'll see you next time on Inbound After Hours. Cheers. We're always looking to improve so if you have some feedback you’d like to share, do it in the comments below!